This is the second bottle from Ridge that I taste during a short time interval. 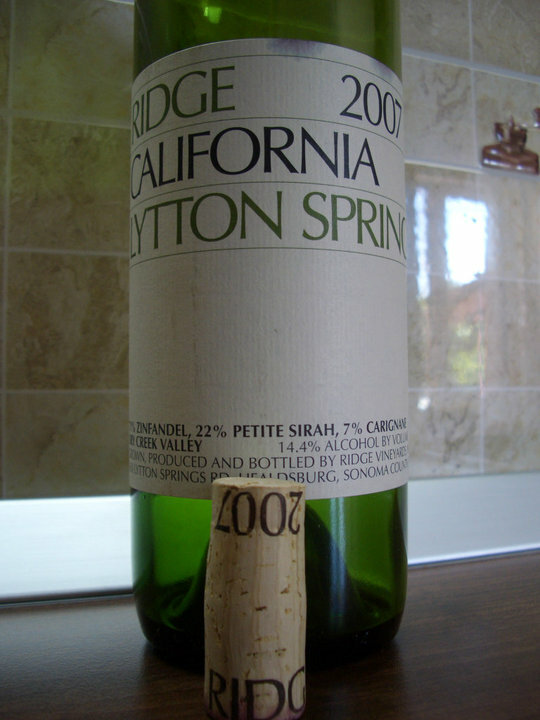 The first one I had a couple of weeks ago, Ridge Lytton Springs 2007, I really liked a lot so I was excited to try a different bottle from the same producer. The wine has a dark red almost opaque color. The nose is very different from the bitter-sweet nose felt initially in the Lytton Springs. 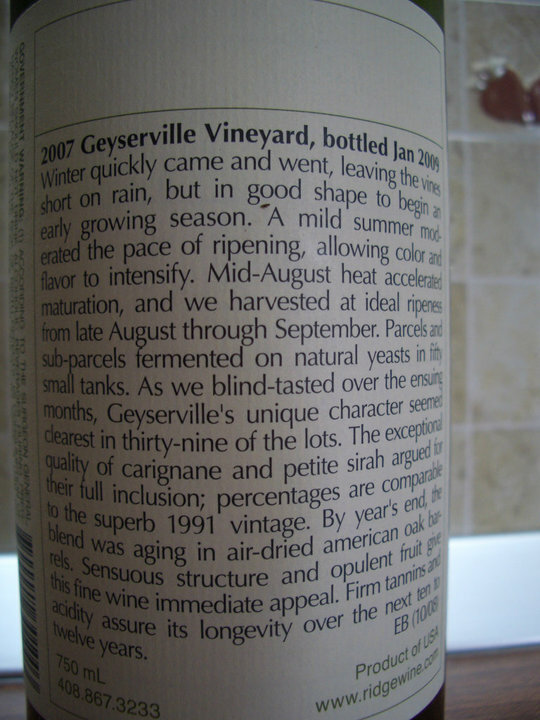 Geyserville is more of a fruit bomb with a sweet creamy nose with dark fruits: ripe blackberry, boysenberry, plum and spiced by cedar wood and white pepper flavors and a discreet wine lees aroma hidden in the background. In the mouth the wine is medium to medium plus body with a rich mouth feel, good acidity, pleasant fruit aromas of plum, blackberry and dark chocolate. The firm tannins give this wine a dry medium finish with a certain degree of astringency, nothing disturbing leaving a thick layer of ripe sweet blackberry on your cheeks. It has a very interesting finish as the mouth remains dry and sweet in the same time in the aftertaste. A Very good+ to Excellent wine. 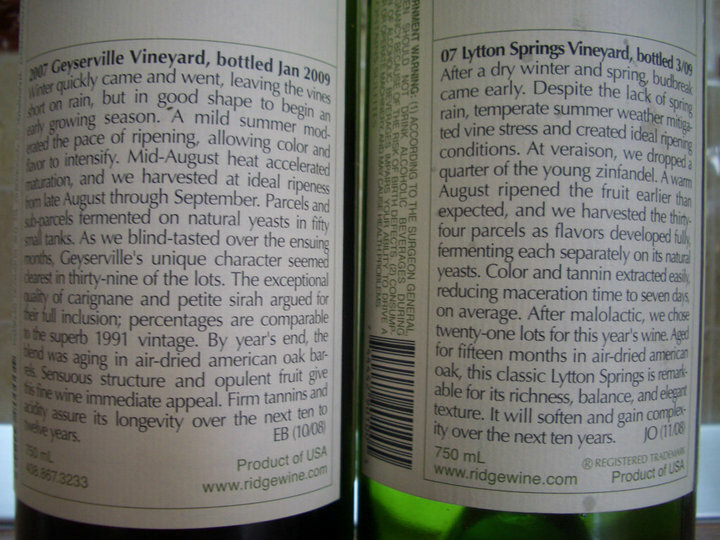 As the memories of tasting these 2 wines are still fresh in my mind I can clearly say I do prefer the Lytton Springs more as it is more complex and not so much of a fruit bomb. I mentioned in a previous post how I became passionate about wine. Even prior to that I had some minor attempts to collect wine, usually buying bottles randomly based on no criteria. Just for the sake of collecting some wine. Recently I finished renovating my cellar and had the chance to clean the dust from all the bottles I collected so far. Boy did I buy a lot of crap in the beginning. Most likely, as my palate and my knowledge about wine evolve, I am sure I will have more epiphanies like this and wonder myself how I could buy this and that. I have many bottles that , based on my actual palate, I wouldn’t buy again and they are a very good proof of how one’s palate constantly evolves and never stays the same. It is a continuous trip to experience new wines and continue to educate your palate and don’t just stop to a few wines you like and keep a closed mind. Especially if one has the means to continuously explore new regions, newer or older vintages, new grape varieties. And thank God there is enough wine out there to keep us busy for a very long time. The conclusion of this introspection is as follows: if you are in a journey to discover wine and you still want to collect bottles try to focus on the ones that you absolutely love at that moment or simply buy what is called Investment Grade Wine(IGW). IGW is that wine that you know will always have a market and be in demand as its value is recognized and accepted by everybody. The best example that comes to mind now is Bordeaux. But not all Bordeaux just the ones that have a well established reputation and people will always seek. This is just an example. There are many other more affordable options waiting to be explored. This is the humble advice of someone who spent already a considerable amount of money for his passion over the years. 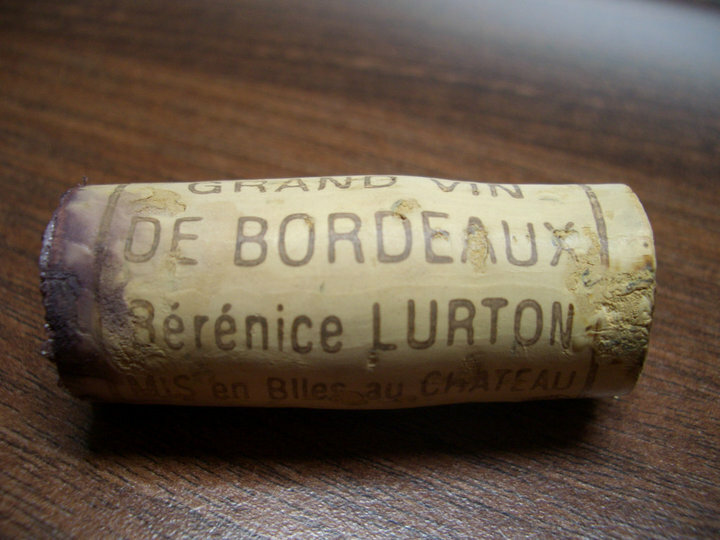 As I arranged the bottles in the cellars I decided to open a bottle of Bordeaux that I remember buying from a Careffour store in Brussels about 3-4 years ago for probably around 5-6 EUR. The wine has a purple red color. The nose was oxidized and with virtual no aromas. In the mouth this wine is seriously disjointed, thin and with not much of a taste at all. There is no aftertaste as the wine is really unpleasant. There is a lot of good even exceptional wine produced in Bordeaux, but there is even more crap wine made in the same region as well. I wish nobody to throw their hard earned money on such a low quality wine. This is a major PASS and be aware that when you spend 3-6 EUR on a wine do not expect the Enlightening. I did not even bother to take a picture of the bottle but you can find one here. It is better sometimes to spend a little bit more on a bottle of wine, but at least you have better chances (prior research is important) to like the wine you get. The weekend offered some very good food experiences and fortunately it wasn’t a total failure in terms of wine drinking. After the two wines I opened on FRI, SAT was a chance to reunite with my family for lunch and drink some wine again. Romania still offers easy access to inexpensive organic food. Therefore SAT we had a really tasty home made meal with slowly cooked organic rooster and duck: rooster cooked for 3 h in a garlic sauce and duck cooked for 4 h with tomatoes, garlic and some other spices. The aromas were heavenly. 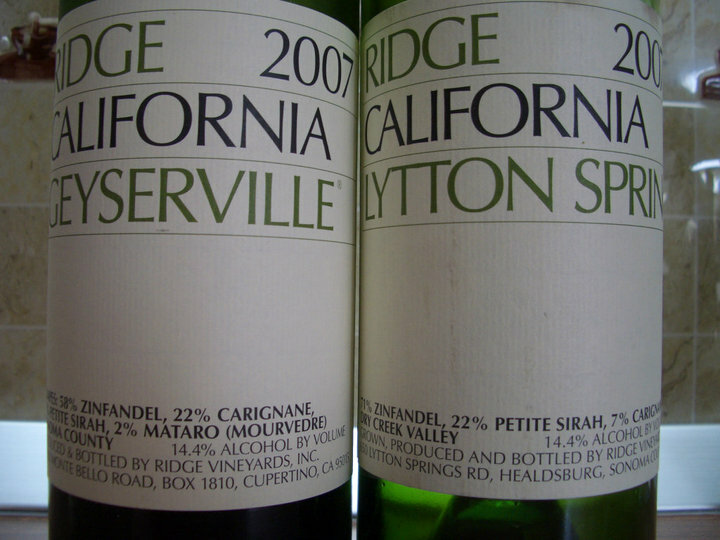 I picked a wine from my cellar that was a 1st time for me, both the producer as the grape variety: an American Zinfandel made by the well known Ridge. It is common for this producer to have at least one wine listed in the Wine Spectator’s Top 100 wines of the year. For my occasion this was a challenging choice to match duck with an American Zinfandel. 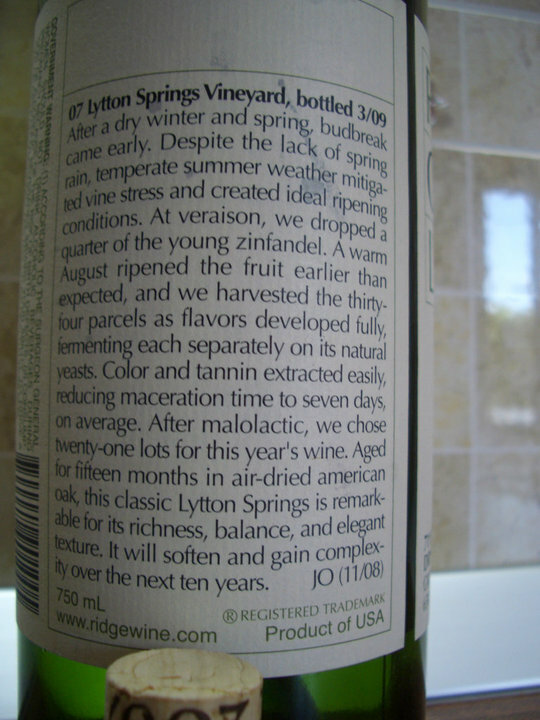 The wine is actually a blend of 71% Zinfandel, 22% Petite Sirah and 7% Carignane and spent 15 months in American oak. It is the very first time I drink a Zinfandel and I was expecting a bombastic wine with the full specter of aromas of M&M’s, especially because of the high percentage of Petite Sirah. Petite Sirah is bigger and bolder in flavors than a regular Syrah grape. The wine has an opaque purple color. The nose shows an interesting bitterness with strong flavors of creamy dark fruits, ripe dark cherries, blackberry, plum, vanilla and chalk. This is a very well balanced nose. In the mouth the wine is medium plus to full body, really smooth, round, with pleasant acidity, with dark chocolate, ripe dark cherries, plum, tea leaves, a hint of minerality, ripe blackberries and firm tannins that can be felt shortly on the back end after which the wine becomes smooth again. There is a nice balance of all its components and that firm grip of the tannins on the back end makes this wine vibrant and really juicy. The wine has a medium plus finish and a beautiful smooth bitterness with dark chocolate and coffee in the aftertaste and no sign of heat from the 14.4% alc. Excellent+ wine for me and I am sure this wine can age and evolve well. I find this wine a perfect mix between Old World and New World styles. 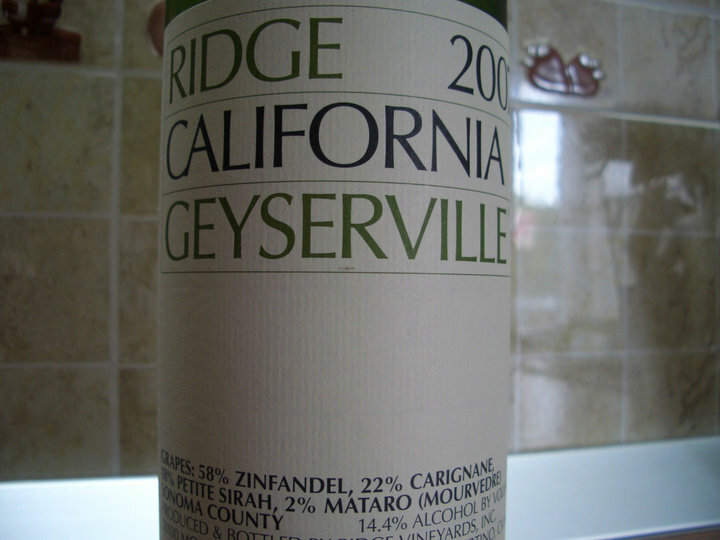 I was pleasantly surprised by how good this wine is and I am really looking forward to open the 2007 Ridge Geyserville that I still have in my cellar. I hope it will be tasty too. 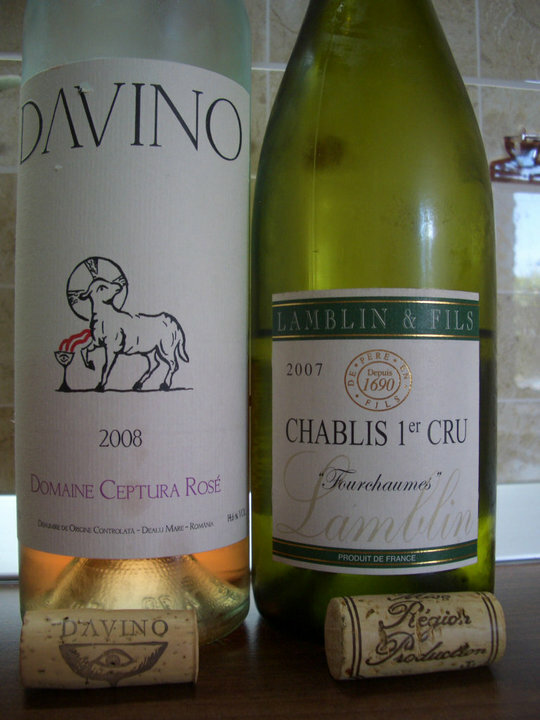 I opened these wines on FRI evening and re tasted them during the following two days. The wine has a pale yellow color. The nose shows discreet aromas of lemon and green apple mixed with wet stone. In the mouth this wine is thin, with a light body, watery, lacking any kind of concentration, has a medium acidity, with some light mineral notes and an unpleasant short bitter finish. A very poor bottle of Chablis 1er Cru. Poor and wouldn’t buy it again. This is a blend of Merlot with Cabernet Sauvignon. The wine has a pink salmon color. Strong aromas of roses mixed with light red fruits are coming on the nose. In the mouth the wine comes with an off dry sensation. On the first day the wine had an unpleasant heat, the 14.6% alc was very present, however over the next two days the heat faded away and the wine became more pleasant, still a medium body wine with a high acidity, with flavors of spicy red fruits and strong red currant aromas. The finish is short to medium. Good but I couldn’t drink more than 1 glass at a time as the alcohol level is disturbingly high in this rose “summer” wine. Overall it wasn’t a pleasant wine session. Hope the next one will be better. It is trendy among young Romanians to say they like wine: but not all wine just red. It seems the whites are not taken seriously. 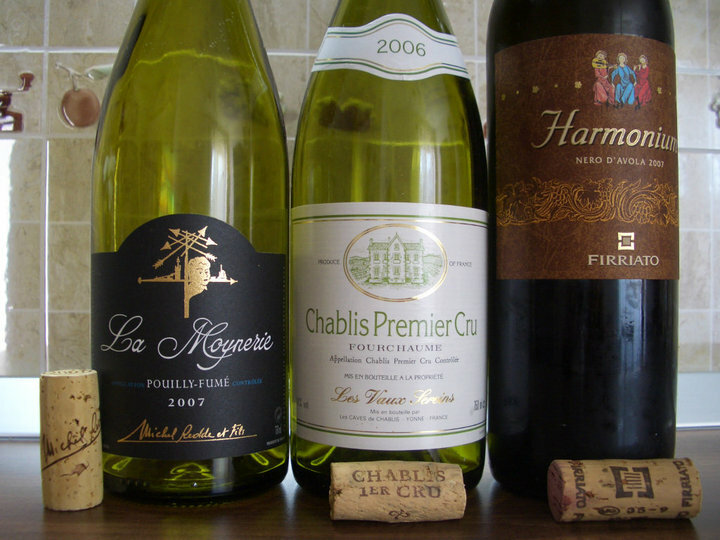 As a contrarian, what opened my eyes and made me love wine was actually a white wine. More precise a 2006 Chateau Puech Haut Tete de Belier Blanc. This simply blew my mind and showed me that not all wines are the same and some can leave you speechless and in a meditative state. That’s how it all started for me. Last evening Chez Grozea’s was a real special dinner prepared together with Andreea. 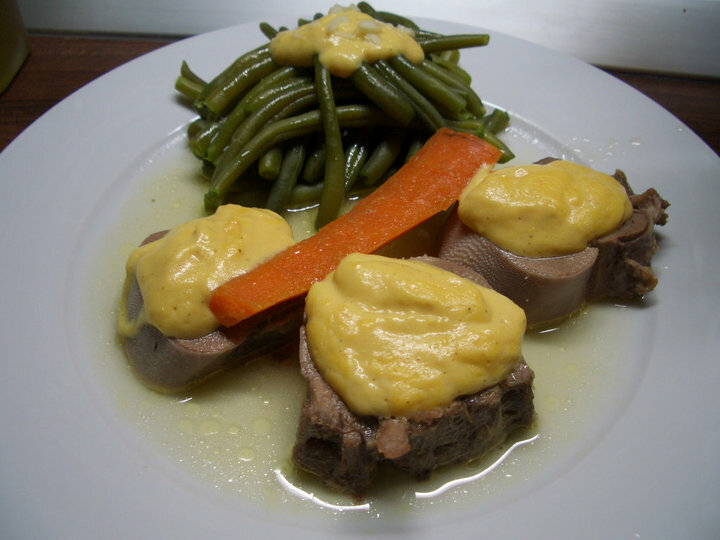 I decided to try to cook veal tongue as I didn’t have it in a while and to try a new sauce: Béarnaise sauce. The recipe is not difficult, you need to make a reduction from white wine, vinegar, fresh tarragon and parsley, shallots boiled until 1/3 of liquid is left. This is mixed together with lemon juice,egg yolks and melted butter. The difficult part is to mix the reduction with the egg yolks and melted butter gradually on a bain marie for 8 straight minutes until the texture thickens and is no longer liquid. That’s where the challenge lies. 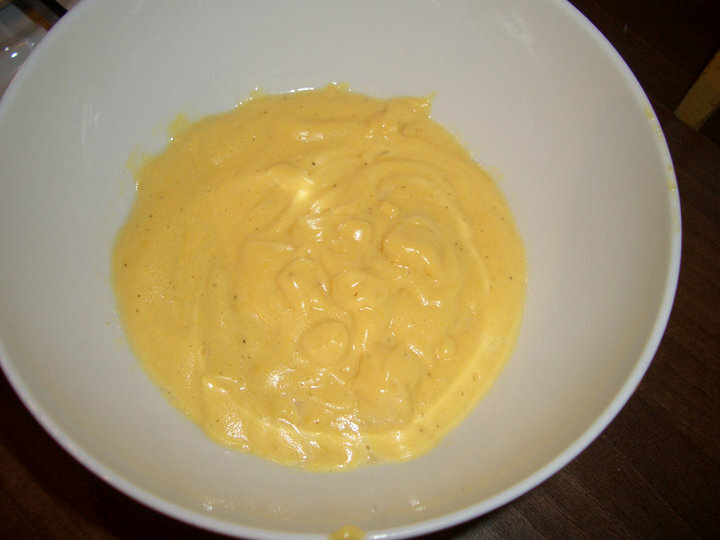 After following these steps my final result looked like this: a beautiful yellow and thick sauce. 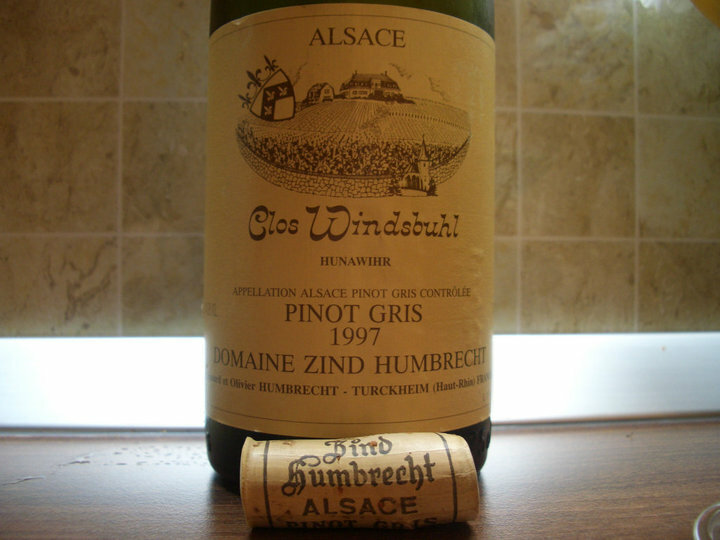 I decided to pair this dish with a white wine: 1997 Domaine Zind Humbrecht Clos Windsbuhl Pinot Gris, a wine I bought from Caves Auge from Paris for 37 EUR. The taste of it took me back to that first experience when I became passionate about wine and that pure flavor of honey brought back pleasant memories from my childhood. Some wines have this metaphysical power to take you far away and this makes them so unique. Although the hunting season is off, I was still privileged to indulge myself into a nice home made game dish this week. The menu: wild rabbit. It is very interesting to see the process to prepare the meat before cooking whenever you have the chance. Me: I just did it myself. So after following all the steps to prepare the meat, leaving it in some special juice made with many spices: nutmeg, thyme, salt, pepper, garlic, onion, celery, carrots, lemon, red wine, olive oil and a little bit of vinegar overnight, the final result was really tender and tasty. Usually it is good to serve the meat with a sidedish made of components that are found in that particular animal’s eating habits. Therefore carrots were a good choice and made for an excellent sidedish. 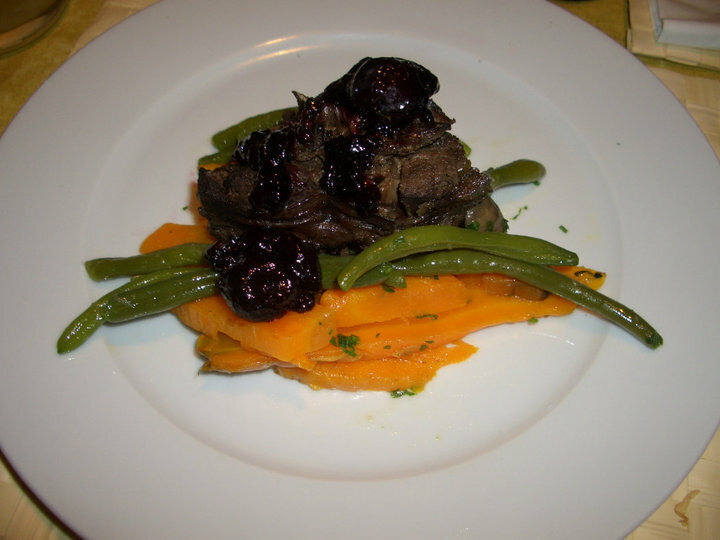 Here is the final result: carrots and green beans sauted in butter, mushrooms, wild rabbit stuffed with pig fat and garlic covered with dark cherry spread. As cooking the rabbit took almost three and a half hours, we had two white wines meanwhile. The wine has a deep clear gold color. 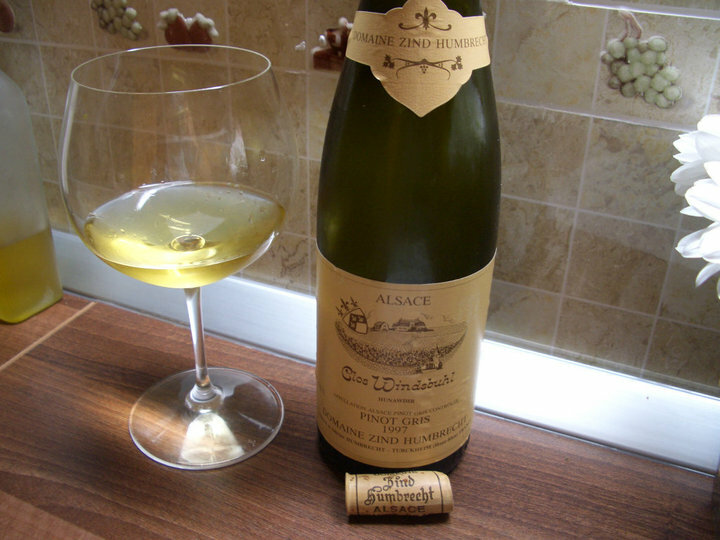 The nose shows lemon, apple on the background with strong mineral flavors and yellow flowers. In the mouth the wine is round, with bright acidity, medium body with beautiful minerality, chalk, wet stone and a layer of honey. The finish is deliciuos, medium with a persistent minerality. A Very good+ to Excellent wine that is easy to drink, the bright acidity makes it a perfect choice for summer. It is important to note here that one of the guests tasted a similar bottle in the past and didn’t feel the heat previously. It would be interesting to taste again a new bottle to see if the heat sensation persists and this was just an isolated case. I think there is a tremendous potential for Coteaux du Languedoc to produce outstanding wines so a lot of the wines in my cellar come from this place. Today I had the chance to re-taste the 3rd time a wine from a relative small producer that made an amazing cuvee in the hot 2003 vintage. 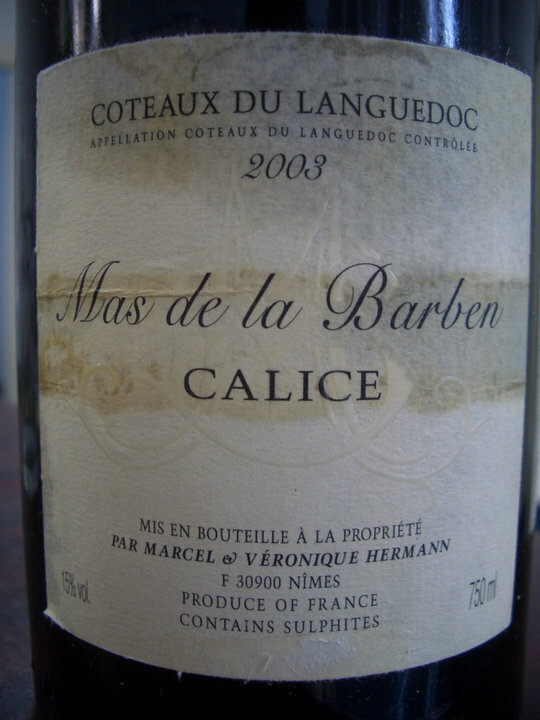 Mas de la Barben is not an internationally acclaimed producer therefore the prices are still decent and the quality of this wine is really good. The label on the bottle is a beautiful work of art. The wine has an opaque dark red color and an oily appearance in the glass. The nose is very rich and complex with ripe cherry/strawberry jam, a big plum component, tobacco, a lactic flavor,wine lees and some pleasant earthiness. In the mouth this wine is extremely viscous,reminding of a good Chateauneuf du pape, silky tannins with really no aggression on the palate and an immediate sweet sensation probably from the high alcohol level. The Grenache is really outstanding and pure in this wine. It has layers of ripe cherry and strawberry liquor, black pepper, very fat, bacon comes to mind, licorice, very round and smooth. 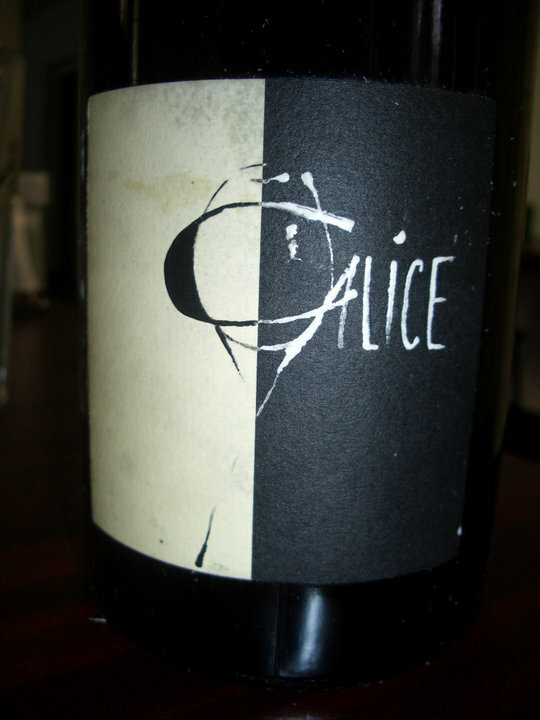 At 15% alc this wine has a tremendous balance and there is only a very discreet sign of heat but nothing disturbing. Considering the high temperature from outside, 35 Celsius degrees, I would say this wine has perfect balance and is fairly easy to drink. However make no mistake: its high alcohol level is heavy to indulge during a hot summer day and needs some serious food to be paired with. Make sure to decant it at least 1 h prior to serving and serve it at 16-17 C degrees. The aftertaste is medium to long with pure ripe red currant and cherry liquor. This is an outstanding wine therefore for my palate I find it Excellent. This is a really good wine for the price it sells and probably if it would have had the Chateauneuf du pape label, the price would have been much higher. So for anyone that wants to taste high quality Grenache this is really a very good pick.